Even before its release, a leaked manuscript of Reham Khan’s book attracted legal notices in June from four persons featured in her narrative, and threats to sue her for defamation from Jemima Goldsmith, Imran Khan’s first wife. 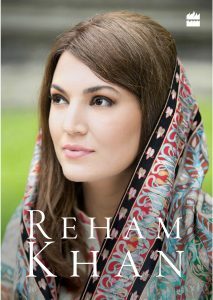 The book cover has the words ‘Reham Khan’ printed in large letters below a photograph of a striking woman, lightly made-up, her brown hair half-covered with a dupatta. That should leave you in no doubt that this is a book by Ms Khan, of Ms Khan and for Ms Khan. About two hundred of the four hundred and forty-eight pages of text are filled with horrifying details of her first marriage to Dr Ijaz Rehman, a UK based psychiatrist, and her struggle to raise three children. Dr Rehman is among those who have sent legal notices, and has, in an interview, denied accusations of violence against Ms Khan and contested her version of the story. Khan’s book, which quickly became controversial, starts off on an innocuous note on her secure and rather rosy childhood, with loving parents. She grew up in a westernized, liberal Pakistan before General Zia ul Haq came on the scene. All that security and comfort changed when she married at nineteen years of age a much older cousin, and she lived on a razor’s edge in a household maniacally micro-managed by her husband whom she depicts as at the very least insecure and at worst a criminally violent, callous and uncaring man. She finally leaves him after thirteen years and takes up various jobs, as a TV presenter and later the Weather Girl for the BBC before landing up in Pakistan. That’s when she interviews the former cricket test captain Imran Khan, the President of the Pakistan Tehreek-e-Insaf (PTI), and now, the Prime Minister of Pakistan. Khan’s journey is a graphic account of what she, like so many other women has had to go through in their lives. It was her meeting with Imran that probably changed her life in many ways. As a successful TV personality, though Pakistani journalists are disparaging about her credibility and didn’t take her book seriously enough, she couldn’t pass up an offer of marriage from the once-devastating Kaptaan himself. Despite her misgivings and those of her children, who remain her major support, she consented to marry this man, not known for his intellect or his fidelity by all accounts. She is not ecstatic about her life in his sprawling and unkempt mansion in Bani Gala, on the outskirts of Islamabad, overlooking the Rawal Lake, all the while trying to set so many things right. From repairing and re-decorating the house, paying for groceries, cooking and cleaning, fending off his predatory sisters and his coterie, and his demanding harem, Reham Khan tried to settle herself into her expected role as the ‘National Bhabhi’, and failed. Being a devoted wife, she undertook to lend an ear and become a helping hand to the problems of people, soon started addressing election meetings. The venal politics within PTI and in her country did not allow her to get much further in her new avatar. While she was dealing with politics and trying to get her husband to change the corrupt ways of the party and its government in the Khyber Pakhtunkhwa province, she also discovered a side of Imran that is told in breathless detail. The anecdotes often seem salacious, but his cocaine habit, his poor personal hygiene, his penchant for black magic, his numerous liaisons, his affinity to the rich, lack of accountability for his expenses and those of the party, were already the subject of much gossip. The author adds what is worth to the already muddied image of the man who eventually did become Pakistan’s Prime Minister. Her book was timed to appear before the elections earlier this year but obviously it had little impact on influencing the mind of the voter and for the most part was treated as gossip or revenge of a scorned woman who neither knew nor understood politics. Her marriage with Imran lasted ten months or so. Khan has plenty of advice for women who have gone through what she has and also a bit on her commitment to care for children through her NGO, the Reham Khan Foundation. Her declaration that she was never meant to be married and that everything that happened to her was accidental are meant to offset later accusations that she was a ‘conniving and manipulative woman’. She also declares that she never had time for ‘men who are obsessed with their positions, and have never hidden my disdain for them.’ Surprising for a woman who went on to marry a man clearly obsessed with his leadership qualities and ambitions. Often, she speaks in the third person to describe her situation. After she got a job in Legal TV, her first after she left her husband, she says, ‘No one could have ever guessed that this young looking, composed anchor tackling serious issues was a mother of three, had just come out of an abusive marriage, and had raced into work with a three-year old in her arms.’ And she seems to have writing mood swings—from low to high—for instance: ‘I entered 2018 as an able bodied, healthy, energetic woman. How could I say that I have had a bad life? There was never a dull moment… I began to see my whole life as a holiday…’ and so on. It certainly wasn’t a holiday by her own narrative and she intersperses all this with a vignette of General Musharraf singing his favourite Bollywood number at a private party, or how male guests on her show treated her like a bimbette and asked for her to be replaced, among other things, and finally meeting ‘the legend’ (Imran) when she joined as anchor at News One, for an interview. After a car accident she has this to offer as a homily: ‘For a woman who is considered attractive, making friends is not easy. Women will hate her and men will want to have her. It’s a lonely existence… My crutches in a way became my wings.’ She watches horrified as strange women are appointed to PTI, Anila Khwaja in particular who got a job as the International Media coordinator of PTI; her job, Reham realized, was much more than that and its ‘sexual nature’ disturbed her. Khwaja has also sent the author a legal notice. In the midst of so much chaos she found the time to produce a film, which has become quite popular but there too, she had a bad experience. However, she claims to have moved on and now focuses on working with children and caring for her own. Even if her book didn’t have the impact she had hoped for, she has muddied the pool somewhat with her eviscerating portrayal of Imran. After online leaks about his illegitimate children and his drug habit, in an interview to Daily Mail, Imran said marrying Reham was the biggest mistake of his life. Others who have sent legal notices claiming the book contains false and damaging material include cricketer Wasim Akram and businessman Zulfiqar Bukhari. She is the subject of much hate and contempt for what she has done by way of writing. If only the book were half its size! To conclude, a tedious read at times, but the details of the PTI corruption and functioning, and the circle of venality, the sordid details of Imran Khan’s life, cannot all be untrue in its entirety. Some of the content could definitely be damaging to those she has written about, going by the legal action that has been initiated. In the end one is left wondering how much of what she has written is true, even credible? Meena Menon, former deputy editor of The Hindu, is now an independent journalist. She is the author of Riots and After in Mumbai (Sage), Reporting Pakistan (Penguin Random House), and the co-author of A Frayed History: The Journey of Cotton in India (Oxford University Press).